This is a technical post so those of you that are faint hearted please give us or your local repair centre a call. Also this process involves removing two covers from your Technics and hence exposing bare connections to electrical terminals potentially at mains voltage. The fabulous 1200 MKII and 1210 Mk II DJ turntables from technics are like a reliable car they go on and on as long as you look after them. The pitch is one of the most common things to start causing you problems and is of course crucial to any DJ who is beat matching. When your turntable starts slipping its pitch or takes the occasional crazy you must get it sorted out or risk looking like a beginner when out playing your latest set. There is of course the possibility that you need something replaced ( I will touch on this at the end) by an experienced technician and the process of setting up you pitch is something that does require specialist test equipment and an understanding of all things technical. You need to turn off the power to your turntable and remove the plug from the wall. Remove the platter by placing one finger in each hole and pulling directly upward. This can be quite tricky and you must make sure to pull straight upwards with equal force so as not to damage the central spindle. Under the platter you will find there is a black vented panel held doen by about five philips screws. Undo these to reveal the motor and control board. The area will look a bit like this but with lots more colourful components (just the ones you need to know about are here). To make this adjustment you will need a frequency meter that is acurate to two decimal places at a up to 500kHZ range. Most good multimeters will give this functionality. Set you pitch fader to the zero position and ensure the green light lights up. 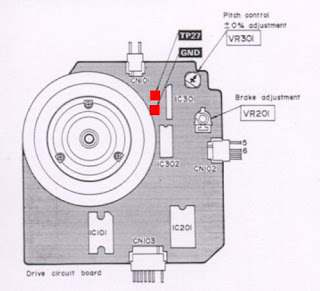 Place the two probes of you meter on the two test points marked in red and have a small philips screw driver ready to adjust the pitch control adjustment VR301. ENSURE THAT YOU ARE WELL CLEAR OF THE POWER SECTION OF THE UNIOT TO THE RIGHT HAND SIDE OF THE BOARD SHOWN ABOVE. No you need to plug in the unit and turn the power on using the power on knob. Your meter should hope fully read something around 260kHz. Turn off the power and re-assemble the unit. You turntables pitch has now been correctly calibrated to the zero point of you pitch slider. This is important so that your tunes play at the right speed but can also cause problems at the extremities of th pitch fader if the value is to far away from the nominal value.